A review of The Alchemy of George Ripley, 1470-1700, by Jennifer Rampling. 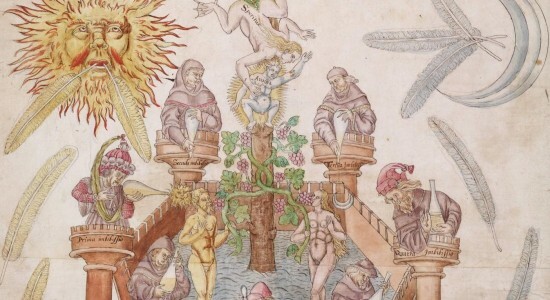 Over the past decade or so, scholars of the history of science have begun to re-evaluate the legacy of alchemy and to highlight its many contributions to science, medicine, and intellectual life from the Middle Ages onward. Work done by William Newman, Lawrence Principe, Bruce Moran, Lauren Kassell, and Tara Nummedal (among others) has shown that, far from being frauds and quacks, many medieval and early modern practitioners of alchemy were engaged in serious scientific exploration that has significantly shaped the development of various strands of natural science. Jennifer Rampling’s dissertation joins this reinvigorated exploration of alchemy. Taking her cue from earlier inquiries into authorship and pseudepigraphy in alchemy (such as Michela Pereira, The Alchemical Corpus Attributed to Raymond Lull. London: Warburg Institute, 1989), Rampling sets out to study the vast and thorny corpus of writings attributed to George Ripley (fl. 1470s–ca.1490). The aim is to determine (as far as possible) the authenticity or spurious nature of the texts, to analyze Ripley’s alchemical ideas, and to chart the circulation and adaptation of his ideas and writings. Through a study of extant texts, Rampling creates a picture of a serious late-medieval alchemical adept whose status as an authority reached mythical proportions as his authentic writings were copied, translated, printed, reworked, and reinterpreted in the early modern period and as increasing numbers of unrelated texts were ascribed to him. The dissertation is explicitly divided into two major parts (excluding the Introduction): “Ripley as Commentator” (Chapters 1–4), which focuses on establishing the authenticity of key texts in the corpus and on elucidating Ripley’s alchemical ideas, and “Ripley as Authority” (Chapters 5–7, Conclusion), which explores Ripley’s growing reputation and the intense interest in “his” texts in the sixteenth and seventeenth centuries. While the introduction presents some of these major themes, Chapter 1 addresses the central topic of what we actually know about Ripley’s life and how the manuscript record of his texts helps determine or rule out authenticity. As Rampling demonstrates, we know little about Ripley from sources external to the alchemical corpus of writings. The information provided by these texts must be treated with caution, she argues, since texts that include a great deal of alleged biographical data, such as the Compound of Alchemy and the Medulla, survive almost exclusively in copies made long after Ripley’s lifetime. While the Compound appears to makes a more convincing claim for authenticity, the Medulla’s manuscript record leaves authenticity in doubt. Chapter 2 explores this issue further by contrasting the alchemical ideas in the Compound and the Medulla with the alchemical teachings of texts ascribed to Ramon Llull (also known as Raymond Lull). Although the pseudo-Llullian influence on these texts has been known for a long time, Rampling points out that “[Ripley’s] exposition of these obscure doctrines remains little understood” (p. 42). The analysis reveals intense engagement with pseudo-Llullian concepts in both the Compound and the Medulla, from the same, similar, or complementary perspectives. Key concepts for both texts are sericon (“an imperfect metallic body”) and associated procedures, which Rampling terms ‘sericonian alchemy’. At the same time, the texts display some differences, which are attributed to differing audiences, complementary aims (transmutation vs. medical applications), and the influence from different source texts. This final idea (influence from source texts) is pursued in detail in Chapter 3, where Rampling presents evidence that Ripley drew heavily on a previously unidentified text in constructing his Compound of Alchemy. The Scala philosophorum by Guido de Montanor, a little-known fifteenth(? )-century alchemist, provides the structure of the twelve gates that so famously underpins Ripley’s Compound, and Ripley appears to translate whole passages more or less verbatim from the Scala. The key to understanding the Compound, according to Rampling, is the diagram (or “wheel”) that often accompanies Ripley’s text. Also borrowed from the Scala but presented in a substantially modified form, the wheel provides a blue-print for the interpretation of Ripley’s ideas. Chapter 4 expands the discussion of the nature of the Ripleian corpus by investigating a particularly complex case of reworking and attribution: The Accurtations of Raymond. The text’s survival in three closely-related fifteenth-century manuscript books that also include other items attributed to Ripley makes a claim for authenticity. The subsequent exploration of the alchemical doctrines of the text, however, reveals marked differences from Ripley’s treatment of similar topics in the Compound, which suggests that it is spurious. With Chapter 5, the focus shifts to the later reception of Ripley’s texts in the early modern period and the expansion of the corpus. Here, Rampling demonstrates the circulation of the Cantilena, a highly allegorical alchemical poem possibly written by Ripley, among a number of early modern adepts. Highlighting previously unknown connections among a number of well-known sixteenth-century practitioners, the chapter illustrates how the Cantilena was furnished with illustrations, couched in various textual contexts, and reworked and repurposed by these practitioners. The repurposing of Ripleian texts is also at the heart of Chapter 6, which focuses on the Bosome Book, a compendium allegedly by Ripley, that was rediscovered under peculiar circumstances by Samuel Norton in the 1570s. Rampling puts Norton’s discovery in the context of issues of alchemical patronage in the sixteenth century. She shows that while numerous other writers and practitioners reworked and appropriated Ripleian texts without attribution to bolster petitions for financial support from the crown, Norton does not hide the nature of his source. On the contrary, Norton’s Key of Alchemie is an explicit commentary and to some extent elaboration on Ripley’s works, drawing on the Bosome Book, which Norton appears to have considered Ripley’s own commonplace book. Though the status of the Bosome Book as authentic or spurious is unclear, it received substantial attention by many writers in addition to Norton, who continued to copy it and rework the texts contained in it. In Chapter 7, Rampling broadens the perspective to explore the continental reception of the Ripley corpus. The exploration concentrates on understanding the genesis and sources of the printing of Latin translations of Ripley’s works, especially his Opera omnia chemica published by Ludwig Combach in 1649. Many of Combach’s exemplars appear to have circulated in manuscript much earlier in Bohemia, some of them showing connections with John Dee, Edward Kelley, and a number of Bohemian alchemists. The conclusion explores especially how Ripley’s ‘sericonian alchemy” was reinterpreted in light of more current debates and practices from the 1650s onwards by George Starkey, aka Eirenaeus Philalethes. Indeed, although Starkey acknowledges Ripley’s authority, “the alchemy is no longer [Ripley’s], as the structures and metaphors of his familiar works are appropriated to serve new practices” (p. 216), especially Starkey’s interest in antimony. Jennifer Rampling’s dissertation is a sophisticated and nuanced investigation of a corpus of writings that has perplexed previous scholars. Through a meticulous engagement with a staggering amount of manuscript material and through an incisive analysis of the texts’ content, Rampling provides not only a radically new understanding of Ripley, his texts, and alchemical ideas, but also gives us a wealth of information on the circulation of alchemical texts, on networks of alchemists, and on the profound interest in alchemy in the late medieval and early modern periods. University of Cambridge. 2009. 316pp. Primary Advisor: Lauren Kassell. Image: Excerpt from the “English Alchemy Scroll Manuscript by George Ripley” at the Yale University Beinecke Rare Book and Manuscript Library, Wikimedia Commons.